I have programmed eight orchestral concerts in the Classics season. However, before that commences there will be a very special event. The CBSO perform music from all eight Star Wars films. The orchestra for this event is huge and so it will be staged at the Regent Theatre because the Victoria Hall platform is not large enough to accommodate over 80 musicians! One of our favourite maestros, Vassily Sinaisky will conduct the opening CBSO concert, with Benjamin Grosvenor as soloist, and the finale event with the BBC Philharmonic. The Hallé appear on three occasions. There will be two Victoria Hall debuts when Alexandra Dariescu, after delighting audiences at several recitals and Martin James Bartlett, BBC Young Musician winner four years ago, will appear with the BBC Philharmonic. As the Forum will be unavailable next season, our new home for the Piano Masters Series will be Stoke-on-Trent Repertory Theatre. It is a wonderful intimate 235 seat performance space and is to be completely reseated during August. Leon McCawley opens the season following literally dozens of requests to re-engage him. Pavel Kolesnikov also returns by popular demand to close the season. The ‘Rising Star’ is Spaniard Juan Pérez Floristán making his second only appearance after playing the prestigious Wigmore Hall. Recital aficionados favourite Freddy Kempf and the legendary John Lill complete another outstanding world class line-up. 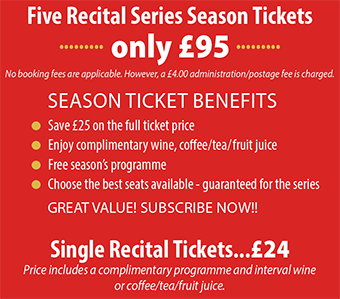 Season Tickets for both series are very attractively priced and offer superb value! Our Patrons and Festival Friends have continued to generously support our events and that income, together with the Gift Aid generated, makes an enormous difference, allowing me to programme some of the country’s finest orchestras and world acclaimed soloists. My sincere thanks for your ongoing support of our charitable organisation and please do encourage your friends and acquaintances to join us. I look forward to welcoming you again next Autumn.